Tennis is played by people over the world as a great form of exorcize and recreation. There are also many levels of professional play in tournaments around the world and the first Gland Slam played as the year begins is at Melbourne Park, the Australian Open. 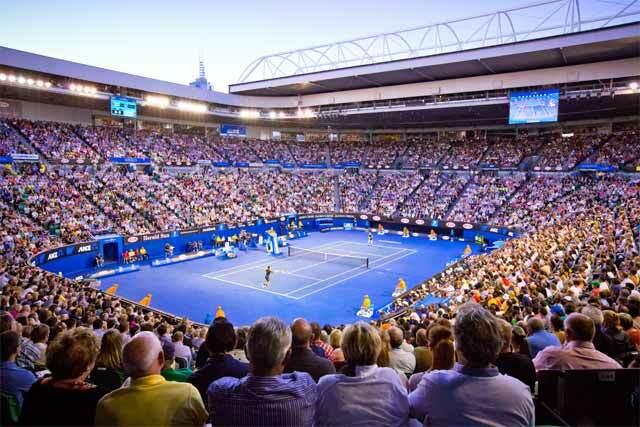 Top players from all over the world come to Australia in front of the Tennis fanatic Aussies and try to grab the largest prize of any other Grand Slam. Learn more about Tennis here to enjoy it more. Louis X of France is believed to be the first person to construct an outdoor tennis court, but back then the ball was struck with the palm of the hand. It wasn’t until the 16th century that racquets came into use and the game began to be called ‘tennis’, coined from the old French term ‘Tenez’ which translated to receive or take. Between 1859 and 1865, Harry Gem and Augurio Perera developed a game using the same concept and combined elements of racquets and other ball games and created lawn tennis. In 1972, they founded the world’s first tennis club in Leamington Spa in England. Major Walter Cholpton Wingfield is highly credited for spreading the game worldwide and also the development of modern tennis. The sport came to America in 1874 and the first American National championship was played in September 1880. The U.S open, one of the grand slams of modern day tennis was first held in 1881. The world’s oldest and now most prestigious tennis tournament, Wimbledon Championships, were first played in London in 1877 and culminated a significant debate on how to standardise the rules. The Australian Open dates back to 1905 where it was first played at the Warehouseman’s Cricket Ground in Melbourne. In the 1950’s, Australia became a tennis power and Australian men won the Davis Cup 15 times from 1950 to 1967, led by outstanding players such as Frank Sedgman, Ken Rosewall, Lew Hoad, Roy Emerson and Ashley Cooper. Now Australian Open is a significant part of Tennis Grand Slam. The basic area where tennis is played is called the court. This is a rectangular flat surface of varying types including concrete, grass, and clay. The standard tennis court is 78 feet (23.77 meters) long and 27 feet (8.23 meters) wide for singles matches. For doubles matches the width of the court is increased to 36 feet (10.97 meters). Additional clear space around the court is required in order for players to reach overrun balls. A 3 feet 6 inch (1.07 meters) high net is stretched across the court, dividing the court in half. The lines that delineate the width of the court are called the baseline and service line (middle of the court). The inner side line is the border line of singles game where as the outer side line is used as a border for doubles game. The essential equipment for this game is racquets and tennis balls. There is an officiating head who sits in a raised chair to one side of the court who is the main umpire for the game. The umpire has absolute authority to make factual determination. The umpire is generally assisted by line judge and net judge. The referee, who is usually located off the court, has the final authority. When called upon, the referee has the authority to overrule all the decisions made by the umpire or any other judges in the game. Tennis is one of the most popular individual sports in the world. 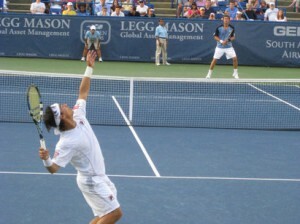 In tennis, the player uses a racquet to hit a ball over a net into the opponent’s side of the court. The ball must be kept in play and can only bounce one time on the court surface before the opponent must strike the ball back over the net. Tennis is often played with one player per side (singles) or with two players per side (doubles). In tennis, opposing players are on opposite sides of the net. Each point is started by a serve. The player that hits the serve is called the server. The server alternates between the two sides for every game played. The server must hit the ball over the net, without touching it, and into the service box that is diagonally opposite from where he/she is standing. The server gets two tries to get the ball in or loses the point. Once the server hits the ball in the opposite team will attempt to hit it back and a rally will begin where each team must hit the ball over the net and into the opposite court without allowing the ball to bounce twice on their side of the court. A point is given to a player if the opposition fails to return back the ball to his side of the court. A point is also given if the opposition returns the ball but the ball goes over the boundary line without touching the surface of the opposition’s side of the court. Every series of point win is described in a different manner, namely, love, fifteen, thirty and fourty. After fourty, the player wins a game. Typically, a player wins a set by winning at least six and at least 2 games more than the opponent. The outcome of a tennis match is determined through a best of three or five sets system. The first player to win two sets in a best-of-three, or three sets in a best-of-five, wins the match. A set consists of games, and games, in turn, consist of points. Tennis is played by people over the world as a great form of professional sport and recreation. There are also many levels of professional play in tournaments around the world; the four top tournaments are called the Grand Slam Tournaments. These are Wimbledon, the US Open, The Australian Open, and the French Open. Millions of people watch these tournaments making tennis a great spectator sport as well. Tennis had once lost its spot in the Olympic Games but was re-introduced from 1988. Australian Open is one of the 4 Grand Slams first held in 1905, and is chronologically the first tournament among the 4 Grand Slam tournaments. Every year this tournament is played in the Hard courts at Melbourne Park in Melbourne and the tournaments features one of the highest attendances, second only to the U.S. Open. Australian Opens brags on giving one of the highest prize money of any tennis tournament, totaling to AUD 30,000,000 from 2013 onwards. Novak Djokovic won the men’s single and Victoria Azarenka won the woman’s single in the 2013 Australian Open. The French Open is a major tennis tournament held in Paris, France. This premier clay court championship founded in 1891, the French Open, also known as Roland Garros is played every years in the 2 weeks between May and early June of every year. The French Open is by far the largest clay court tennis tournament in the world. Rafael Nadal won the men’s single and Serena Williams won the woman’s single in The French Open 2013. Wimbledon is the oldest and widely considered the most prestigious tennis tournament in the world. It’s held by the All England Club in Wimbledon, London and starts towards the end of June each year for 14 days, beginning on a Monday and ending on a Sunday. The Championships, Wimbledon is the only Major Grand Slam tournament that is still played in the traditional Grass Court, giving the game its original name of Lawn Tennis. Andy won the men’s single and Marion Bartoli won the ladies single in the 2013 Wimbledon. Founded in 1881, the United Stated Open Tennis Championship has been chronologically the fourth and final tennis major taking place in Late August and ending early September of every year. 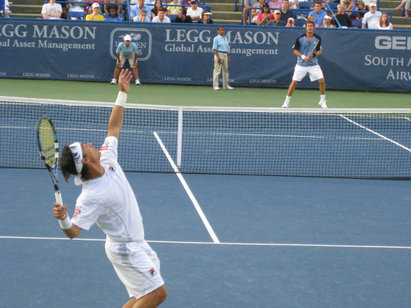 Since 1978, the tournament has been played on acrylic hard courts in New York City. Rafael Nadal was the winner of Men’s Single and Serena Williams was the winner of the Women’s Single in 2013. Tennis has always been a great sport backed by great legends like Bjorn Borg, Pete Sampras and Andre>Agassi. After these men retired from their golden career, they were followed by Roger Federer who many consider the greatest tennis player in history with 77 career titles in his name. Roger Federer’s biggest rival Rafael Nadal is also on his way to being one of the greatest players this sport has ever seen. 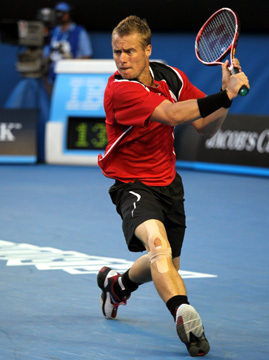 A notable Australian Tennis player from Australia is Lleyton Hewitt, who became the youngest player ever to be ranked number 1 at the age of 20 and also won the 2001 U.S. Open and 2002 Wimbledon’s Men’s single title in 2002. Bernard Tomic, another notable player from Australia enjoyed his junior run winning 2 junior grand slams and also won three Orange Bowl titles.